These are just some of our second hand adult’s bikes we have currently in stock for sale – for collection only from our premises (unless otherwise stated). They have all been fully stripped down to the bare frame and reassembled using new parts where necessary. We have many more bikes in stock, which are not listed on this website, so it’s best to come and have a look around at our indoor display area. Our used bikes are excellent value for money! Condition: Very good – loads of new parts (rear wheel and tyre, cassette, chain and chainrings, saddle, brakes, cables, shifters and headset bearings. Fully serviced. Usual Dawes quality with light aluminium frame, Marzocchi EXR Supra forks, mechanical disc brakes, Deore XT Groupset, X Fusion O2 air rear shock. Not many of these around. Condition In excellent condition, fully serviced.This is a very nicely specified bike – 105 gearing (2×10), Miche brakes, Conti Ultra tyres, Mavic sealed bearing wheels, titanium skewers, carbon seatpost, carbon/titanium saddle. It has brand new cassette, bottom bracket, stainless steel cables, bar tape and chain. Has done very few miles after being built around a new frame. 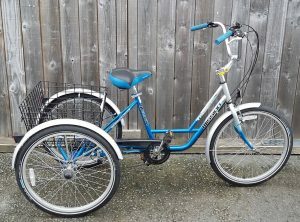 Condition: Excellent condition, has brand new rear wheel, new tyres and tubes, new saddle, new cables and new brakes. Fully serviced.. Condition: In very good condition, nice light frame which has been fully serviced with new BB, brake pads,chain & cables.